The Wolfspitz is a medium-sized dog that resembles a wolf for the color of its coat. A little bear 'and a little' fox is a dog that seduces with its beautiful coat colors of a stormy sky, held up by a thick undercoat on his head with lively eyes and small pointed ears and close that give it its characteristic appearance impertinent. 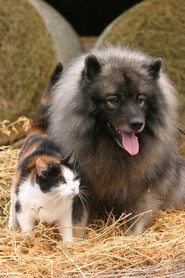 No definite proof of the origins of the Wolfspitz exists. Of all the Spitz, that were bred exclusively for hunting, only the Wolfspitz shows no instinct for this activity. 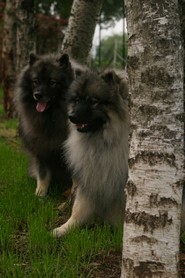 The Wolfspitz has never been used for hunting, employed only as guard dogs. What follows below is taken from Anne Burnett, a specialist of the breed. 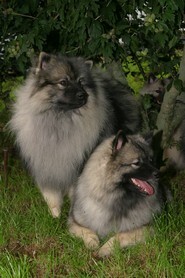 The Wolfspitz, before being included in the German breed, was for a long time included with those originating in Holland where it was called “Keeshond” and considered a national emblem - so much so that the dog lovers of this breed oppose, without success, the change in nationality of this dog. The name by which it is known in Holland (even today) seems to come from William Cornelis van Gijselaaer, known by his followers as “Kees”, who led the revolt in Holland against the House of Orange in the seventeenth century. He owned a large, grey Spitz that never left his side, not even during the battles. So in contrast to the Pug, the prefered dog of William of Orange, the Kees Spitz became the symbol for his followers. Unfortunately, the defeat of the revolt had a devastating effect on the breed. 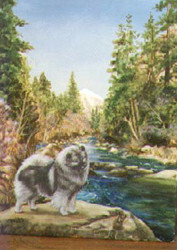 In fact, many owners of the Wolfspitz put down their dogs in fear of being associated with Kees and hence suffering retribution. Fortunately for the breed the rural population living away from centres of habitation, boat captains and travelling pedlars who moved around the country remained faithful to the breed and in the eighteenth century its popularity returned. Many boatmen kept a Wolfspitz as its size and rustic qualities meant that it could accompany the barges during their long journeys down the Rhine. It was also an effective guard dog. 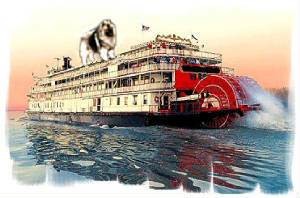 It became known as the Dutch Barge Dog. 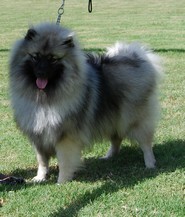 At the beginning of the century an English colonel, Digby, struck by its beauty and its vivacious nature, took a pair of Keeshond back to England. The serious breeding began only after some years from other dogs imported by Winfild Digby and Alicia Gatacre. The dogs born in England made their debut at the Birmingham Show in 1923 and in 1926 the Wolfspitz Club was formed. From that time on there has been a continuous improvement of the breed. Due to its fascinating personality these dogs have spread all over the world as pets, in competitions and particularly as utility dogs. 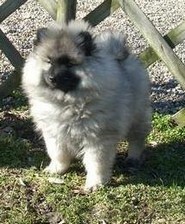 The Wolfspitz is the largest of the German Spitz family (standard no 97 FCI, 5/03/1998) and belongs to Group 5. Spitz type and primitive types. It descends from the peat dog of the Stone Age “canis familiaris palustris”, and later from the dog of the lake cities that is the earliest of the Central European breeds. 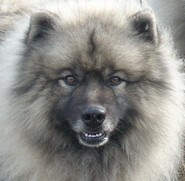 In many non-German speaking countries it bears the name of Keeshond. 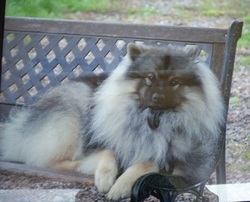 The Wolfspitz is always on the alert, vivacious and very attached to his owner. He is very receptive but - contrary to what is stated in the standard - I wouldn’t say that it was the easiest of dogs to train. He needs an owner who understands his “language” as he is very sensitive to body language and tone of voice. He is very intelligent and needs gentle training. Yes, he is easy to train but only by certain people! He is an excellent guard dog; not timid nor aggressive, naturally diffident with strangers. Other qualities characterizing him are his resistance to all kinds of weather, his robustness and long life span. Extremely intelligent, the Wolfspitz is particularly vivacious, attentive and attached to his owner. You are warned. you won’t ever be able to close a door again without having him behind you. You won’t be able to resist caressing when he asks, playing with him, imploring but a t the same time needful..............you give but in return you receive. He will always be at you side offering his paw, his will to please. You’ll become his accomplices...........but be careful not to become his slaves!!!! Your Wolfspitz will always respect the hierarchy in the family if you are just and consistent with him. When you give him an order it must be obeyed but it is useless to use physical punishment: you won’t achieve anything. This is a dog that if you get it right would walk on his head if he could to please you. He is very attentive to your tone of voice and gestures. He will be offended if you demand but he will be happy to obey you if you give him an order. A subtle difference. This is a dog full of subtleties. Your task will be much easier if you take the trouble to learn canine communication. It is useless to ask him to stay outside if you are in the house unless the door is open so he can watch you. Don’t expect to surprise him while he is sleeping: you might think he is sleeping deeply but as soon as you cough his eyes will open. As soon as you get up he’ll be there in front of you. He’ll be quite happy to lie at your feet even for a long time but he’ll never say no to a run in the woods, a game with the ball or other activities e.g. agility, obedience or work...........tracking or retrieving. In conclusion, take care: this dog will steal biscuits or from the table just as he will steal your heart! he learns quickly and even when a puppy he seems mature for his age. If he has to be left alone he doesn’t get into too much trouble even if he’d prefer to be in your company. The puppy learns very quickly not to soil in the house and where to do his business. He is a great guard dog in spite of his size. He doesn’t need a great amount of exercise although he enjoys his walks. He is friendly towards other animals and children as long as they are friendly too. You need to start his education immediately; you must make him understand what he can do and what he can’t. He’s always testing your consistency. It is a mistake to say “he’s only a puppy, we’ll think about it later” because his greatest positive quality - that is to learn quickly - is also his greatest defect. He can see through you immediately. He can be a bit of a “chatterbox” if you let him so it is in your interest not to let him bark too much. He loves to please you but he is a bit allergic to authority. Sometimes he can be extremely stubborn. He needs to be brushed at least once a week and more when he sheds his coat. No baths!!!!! He could, in spite of regular grooming, have problems with dandruff and dry skin. If this occurs, the problem is resolved by adding a little sunflower seed oil and yeast to his food. For those who are not interested in dog psychology. For those too impatient and who end up striking the dog or for those who let the puppy do anything it wants. For those who have no time to spend with and for the dog. For those who love to have a presence near them and want their dog WITH them but not automatically do everything the dog decides. For those who remain calm and love the exclusive relationship with their dog. For those who love to do a sport together with their dog.